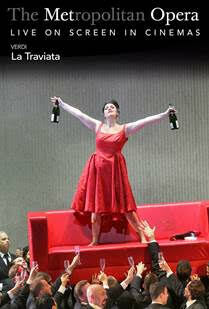 Enter to win an Admit-Two Pass to see LA TRAVIATA Live! Mind on Movies is very excited to announce that we are working with Fathom Events on LA TRAVIATA Live, in selected theaters on Sunday, March 11th at 12:55 p.m. ET to giveaway an admit two to select winners. Sonya Yoncheva brings her acclaimed interpretation of the doomed courtesan Violetta Valéry to Live in HD audiences for the first time, opposite rising American tenor Michael Fabiano as her lover, Alfredo. Thomas Hampson sings one of his most acclaimed Met roles as Giorgio Germont, Alfredo’s disapproving father, in a revival of Willy Decker’s staging conducted by San Francisco Opera Music Director Nicola Luisotti.